Striped Scholar is the perfect style for your graduate! Distinctive stripes across the bottom and top of this sophisticated design frame the happy accomplishment in a beautiful and classy way. The hand-scripted lettering adds a personal, handmade look, and your photo and words makes it personal. Say "Congratulations" to your grad and to the world, starting with Striped Scholar style. Customize your Striped Scholar tags today! 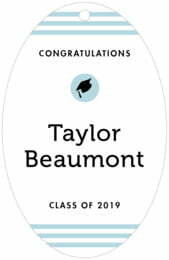 These Striped Scholar favor tags are printed on extra-thick cover weight white paper and come in a variety of shapes and sizes (diamond, circle, heart, square, scallop-edged circle, ovals, and other more intricate shapes). The Striped Scholar favor tags come pre-punched with a small round hole to thread your choice of tie material. They are punched out individually and packaged as a set in small bags. At Evermine, we've put a tremendous amount of thought into our packaging, material quality and lovingly created designs to make all your products and gifts perfect. Have fun personalizing your Striped Scholar favor tags today!